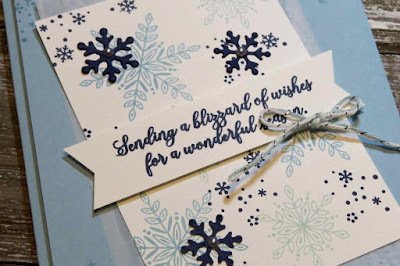 Karina's Kreations: Stampin'Up Snow is Glistening! I made this beautiful card using the Snow is Glistening stamp set and coordinating Snowfall thinlits dies. These will be available Nov 1 while supplies last. The background of my card uses a new color introduced in June, Balmy Blue. I haven't used it a lot but it I love how it pairs with Pool Party and Night of Night ink colors. 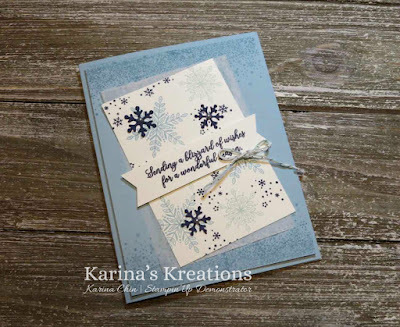 To add some texture to my card, I embossed some vellum card stock with the Subtles Dynamic Impressions Embossing Folder and placed it behind the snowflake panel. I also love the snowflake edge stamp that comes in the set, creating a flurry of snowflakes along the top and bottom of the card. To place an order, please click on a picture below.